In The Ramshead Algorithm and Other Stories, sand cats speak, ghost bikes roll, corpses disappear, and hedge mazes are more bewildering than you’ve ever imagined. 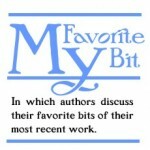 These 11 fantasy and science fiction stories from KJ Kabza have been dubbed “Sublime” (Tangent), “Rich” (SFRevu), and “Ethereal” (Quick Sip Reviews) and will take you deep into other astonishing realities. For me, that’s the sine qua non of powerful speculative fiction: that feeling of awe and majesty, glimpsed when we turn a page and see a vista that’s both thrilling in its possibility and humbling in its scope. Ironically, though, the real world itself is already overflowing with it. Risen lake waters make for striking scenes. 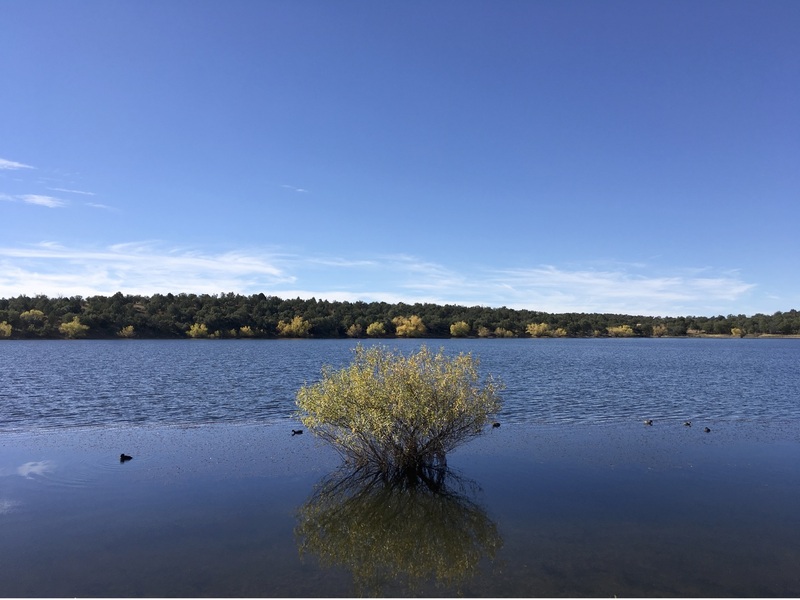 Photo taken at Parker Canyon Lake in southern Arizona (2017). 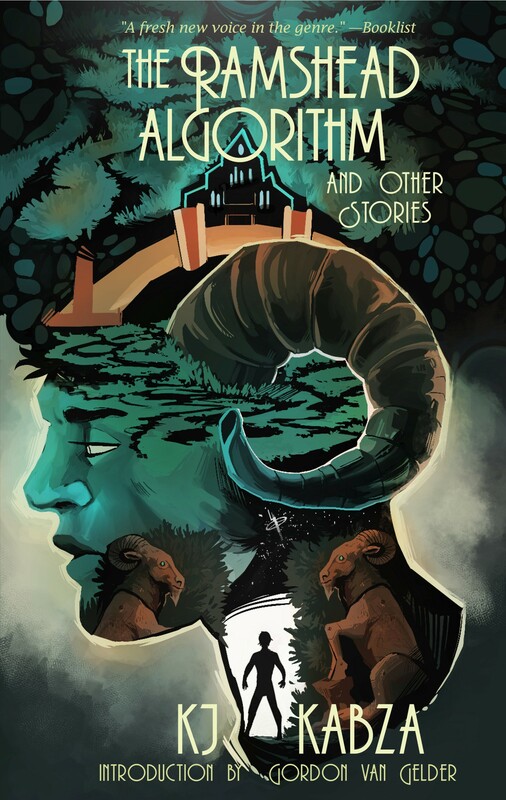 My first collection of print fiction, THE RAMSHEAD ALGORITHM AND OTHER STORIES, contains “strong world building” (Booklist) within stories that are “quirky and original hybrids” (Publishers Weekly) of various subgenres—near-future SF, dark fantasy, fabulism, fables, steampunk, science fantasy, and whatever dusting of whatever other subgenre you care to name perceive. I like to exercise my range and write things I haven’t written before. Integral to writing things I haven’t written before is seeing things that I haven’t before. Visiting new places, especially places outdoors, can be an almost religious experience for me. I once spent a year intentionally homeless, couch-surfing among friends and family across the USA. I have a specific monthly savings goal that I set aside to put into a travel fund. I’ll even go on record saying that trespassing is my favorite crime (but further anecdotes about that are a blog post for another time). I don’t have the patience to livestream my travels, and even if I did, I still couldn’t make everyone feel the frisson that I do when I see something astonishing. But, while I can’t control what you see with your own eyes, within my writing I can control (to an extent) what you see with your mind’s eye. I can hold up a lens of wonder. The anchoring novella “You Can Take It With You” that appears at the end of THE RAMSHEAD ALGORITHM AND OTHER STORIES plays out as a journey across a long, strange, sometimes physics-defying land. I wrote it in 2016–2017, during the winter, the season in my home city of Tucson, Arizona wherein the weather cools down enough for me to go hiking. During that winter, I carefully explored the collection of trails that meet at the northern end of Camino Loma Alta. The Rincon Mountains begin there. There are cacti, and vivid yellows in the hills when the brittle bushes flower, and hidden streams with long-abandoned homesteads. 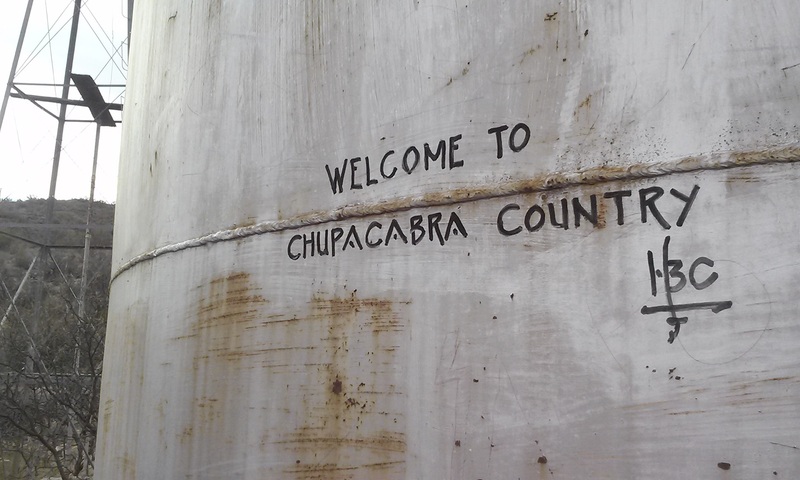 “WELCOME TO CHUPACABRA COUNTRY,” someone has written, on the side of a rusted-out water tank. See what you find, when you trespass? As I hiked along the Hope Camp trail, sharp rocks under my soles and the sky a near-space blue, I felt the place’s rawness and isolation. In such a space is where the sense of self dissolves, and there is only rock and heat, cutting surprising beauty into hidden canyons that no one will ever see. This is the true meaning of a wilderness. There, you will come back to the Hope Camp trail with me, as seen through a lens of wonder. 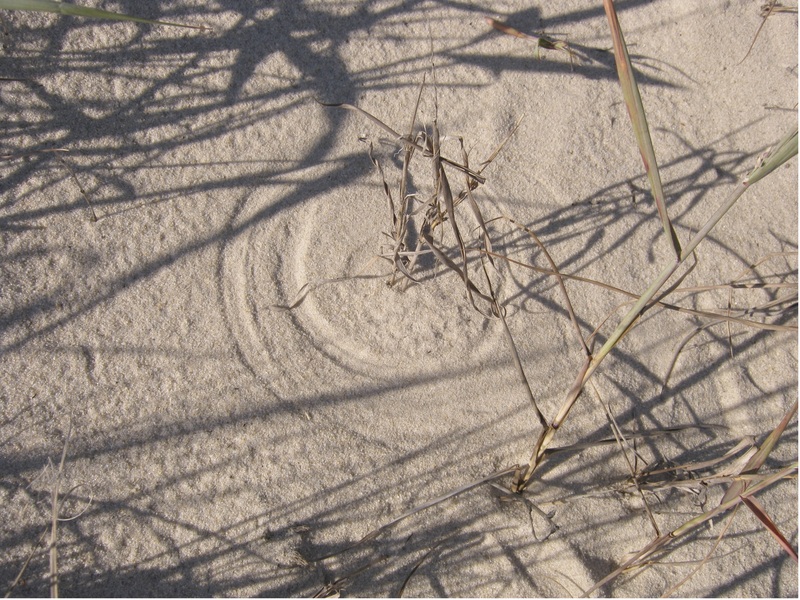 In “The Color of Sand,” look for the line, “Where the sea, sand, and sky come together and kiss, there once lived a boy named Catch,” and you will come with me to the sandy beach of North Cape May, New Jersey, between Franklin Ave. and Emerson Ave., where I scoured the shoreline every afternoon one bright November in search of sea glass. In “The Ramshead Algorithm,” as you tread The Maze that connects all planes of reality, you will also come with me to Cornwall, England, where narrow, rural roads wind between walls of earth, covered in shadow and shifting ivy. When you read “All Souls Proceed,” you will find yourself caught up in Tucson’s annual All Souls procession, marching along night-dark streets at my side, bewildered at the crush of surrounding bodies and the many ragged ways we all express anger and loss. You don’t need to read my work to experience strong world building. Not really. It’s all already out there. 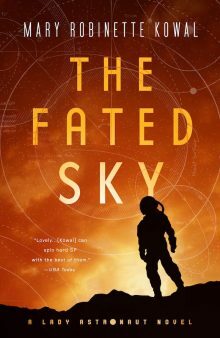 KJ Kabza has written and sold over 70 short stories to places such as F&SF, Strange Horizons, Beneath Ceaseless Skies, and others. Though his work prior to 2014 can be found in two self-published ebook omnibus collections, IN PIECES and UNDER STARS, THE RAMSHEAD ALGORITHM AND OTHER STORIES is his first foray into traditional print publishing. When not writing, he likes to be outside, which is a tough break if you’ve been raised in the northeastern United States (where it’s deliciously cold) but now live in the southwestern United States (where it feels like death in an oven for several months out of the year). Come say hi on Twitter @KJKabza or learn more at kjkabza.com.